In the latest episode of Insiders, we visited La Linea de la Concepcion in southern Spain. 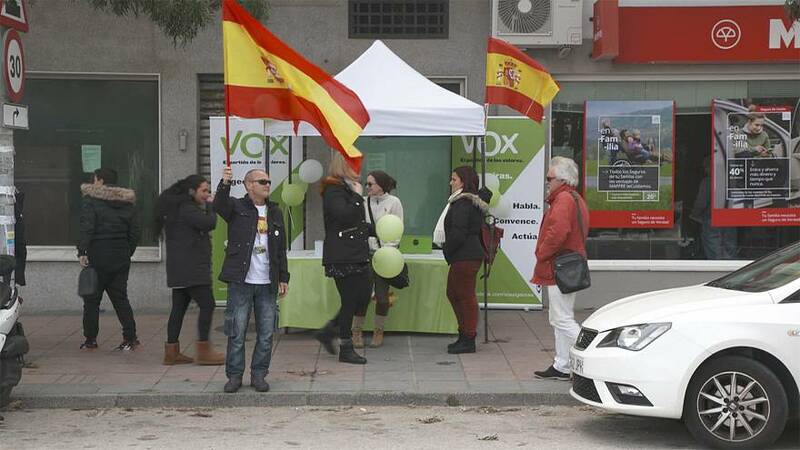 The far-right Vox have gained representation in Andalusia’s last regional elections. The town faces the Strait of Gibraltar and the Moroccan coast, the area is a gateway for illegal drugs coming into Europe. But in recent months, the Spanish police have ramped up their response to narcotics trafficking. But what's spurring the illegal drug trade? Border protection, crime, and unemployment are issues that the far right has capitalized on. Problems like this have gotten parties like the far-right Vox into office in Andalusia’s last regional elections. Vox: What are its policies? Euronews reached out to Vox party representatives for an interview but they declined to comment. In a marketplace nearby, we recorded footage of a heated discussion that took place between a party supporter and a female bystander. The bystander is critical of what she sees as an intolerant stance (from the Vox party) on immigrants and LGBT+ people. The girl tells a woman at the booth: "I don't think it's right! I hear things outside, and I see what you're generating!” The Vox representative asks for more information, “But are you listening to what we are saying? Or to what the media says about us?" "I hear what I hear and I see what I see! Here, you say different things than we hear outside. Seen from the outside, you provoke hatred towards these people!" the girl retorts. At this point the Vox representative tells the girl, "then I'll tell my party to communicate better! Because I guarantee you that we are neither homophobic nor xenophobic!" Vox party members then break up the heated discussion by summoning a policeman to prevent Euronews personnel from recording the confrontation. We interview various Vox supporters about their views on the party. "Vox is a different party, and we hope for a change, that it offers something [different] than the other parties. We'll see if it makes a difference. In order to help workers more, and small businesses. To do more for the poor, for the modest people," said José Santiago – a market vendor and Vox supporter. We speak to a woman who expresses a sense that the Spanish authorities have abandoned Spanish citizens. A few kilometres from the Linea, the port of Algeciras on the Spanish coast, is one of the main entry points for candidates for European exile. Euronews spoke to a group of Vox activists campaigning in Algeciras. "I vote for Vox because I am Spanish. That's all, it's clear enough," said one man. One man tells us he will vote for Vox in the Algeciras election. But though the party is gaining support it still remains politically divisive to many. Euronews spoke to a married couple on the condition of anonymity, they do not agree on their views of the party. The husband is a policeman and voted for Vox. His reasons are a feeling of disappointment in Spain’s main conservative party - the popular party (‘Partido Popular’). "I see a new window of hope, especially in regards to the defence of territorial unity, and the constitution. Especially because of the recent events in Catalonia, and previous years in the Basque Country. Now I see someone who's defending the unity of our country. I am Spanish, and regardless of my political ideas, I defend my country! And I love my country! For me it's a sentiment: when I listen to the national anthem, I get goosebumps!" It remains a choice too radical for his partner, who has stayed faithful to the popular party. His wife reacts to this patriotic statement: "It’s true that there is an Andalusian element of the man of the past, of the Iberian macho, as we call it in Spain. It's a large percentage of the vote for Vox: the man who has idealized what we had before, without even knowing what it was! The vast majority of Vox voters have not experienced dictatorship, because they are not old enough! And so they believe that the past was better, and they will vote for them! The contentious nature Vox can be felt very strongly on the border that separates the city from Gibraltar. Every day, thousands of Spaniards go to work in the small territory, which became British three centuries ago. Vox controversially wants the territory returned to Spain. The party has vowed to create an industrial zone in Linea, to put an end to its economic dependence on Gibraltar. It’s a plan that many disagree with. Garage owner Eladio Pérez says Vox will sabotage his business. The family garage that he manages with his brother is one of the few businesses in the area. "If Vox had their way it would jeopardize my job and those of the whole area; many businesses depend on Gibraltar," 50 per cent of the business’ customers come from Gibraltar. With Brexit looming, Vox's entry into the government would be a disaster, they say. But they don't believe that the Vox phenomenon will last. "Most of the things that they say in their election campaign, for me are not viable and a bit ridiculous. Like, ‘everyone stays outside, we close the border, no abortions for women, less freedom,’ It kind of reminds you of the 1940s, at the time of Hitler.” He says that there is a strong sense of uncertainty in the party. "I think a lot of people voted for Vox in Andalusia without knowing exactly what it represents. I think that more than anything, it was a punishment vote. Because Andalusia has been completely abandoned, by the central government and the autonomous government. And it's one of the regions of Spain and Europe where there is the most unemployment. So I believe, or I hope, that last time it was nothing more than a protest vote." In the small fishing port of La Atunara, many locals share a feeling of abandonment. Unemployment is at 35 per cent in the city. Vox still expects to gain strength. Blocked from the territorial waters of Gibraltar, strangled by quotas imposed by the European Union, the fishermen are struggling. “I believe less and less in politics. Less and less. I wouldn't buy anything from the politicians we have now. We have seen socialists come, and those of the Popular Party and they did nothing, nothing at all! Many promises, which never came true. People are disenchanted. I don't think anyone would have imagined, not even those at Vox, that this party would have got to where it got to. But as we say: we already know the evil. We've already experienced it. Can it be any worse? I don't think so! So let's try, and if it's no good, then in 4 years, we'll see. Because we're fed up with lies. That's not how you can move ahead, that's not how you get a country back on its feet." Valerie sat down with one of the city's best-known intellectuals - Diego López Bonillo, he has a university chair in philosophy. Bonillo stands behind some of Vox's views on territorial integrity. "Vox said that we must reform the Spanish system of autonomous regions. Because it has created different categories of regions […] Why should the Basque country have a tax burden that's different from mine? And it would be nice if the state re-appropriated itself the education competencies as I can't have 17 distinct and divergent versions of history, depending on whether I am from Extremadura, Andalusia or Catalonia. I do believe that the current situation can lead to a disintegration of the nation if we do not take the right path."